The Seattle teachers are on strike. Before you get all huffy puffy about unions because it’s the popular thing to do. Don’t forget the 36 Reasons Why You Should Thank a Union. A quick personal perspective on unions: I didn’t realize it at the time, but the University of Texas at Austin was a worse deal for my budget because I wasn’t unionized. I didn’t know any better until I moved to California State and my health insurance went from costing me about $400 a month to free. You can do the math on the yearly savings. Also, everyone received a raise during my first year at California State, that hadn’t happened in about six years at UT Austin. Do I think unions are perfect? I discussed this at Edweek in Teacher Unions and the Future. Seattle Public Schools teachers haven’t had a cost of living adjustment in six years — and in that time, rents in Seattle have gone up about 40% in some places, meaning our educators are actively making less money than they were a few years ago, to do the same important job. They’re the trusted adults that kids turn to when their homes are chaotic. They’re the professionals who can identify and address behavioral problems, learning disorders, or other issues, which may disrupt the education of a low-income student. They are the surrogate parent, the triage nurse, the support system, and the encouragement — myriad scholars agree that their roles are essential for helping low-income students succeed. And for a very, very long time, they have operated under ruthlessly difficult working conditions, which make doing their jobs very hard. “Without the state stepping up to their constitutional obligation, all of these groups are in difficult situations,” says Jonathan Knapp, President of the Seattle Education Association. Some of the groups, like language and speech pathologists, have literally no contractual caseload limits, meaning they can easily have a caseload in the thousands. Counselors do have a limit — but it’s still astronomical. Darryl James, a middle school counselor at Aki Kurose who sits on the bargaining team, says that the problem begins long before high school, and that early intervention is key. For many students, behavioral problems begin in elementary school — where, thanks to budget cuts and a move toward more discretionary spending several years ago, low-income schools simply do not have — and that can mean loss of classroom time, which all but sets up poor kids not to go onto college. And for low-income students, that’s a stumble from which they can’t and won’t recover — unless they have a trusted adult in a support role who has the time and energy to help them with it. Which is part of what the SEA is striking for right this minute. But, says James, the school board seems unwilling to admit that requiring schools to hire support staff and cutting caseloads is anything other than optional. Rather than viewing a strong support staff as an essential step toward helping curb poverty (and all of the social issues that come along with it) at an early stage, the school board views them as extras — bonuses for schools that can afford them, and unnecessary for those that can’t. In the summer of 2005, the Kansas Legislature and that state’s highest court played a game of chicken over state support of public schools. The Kansas Supreme Court had ordered the Legislature that spring to pony up an additional $285 million for K-12 education or the court would shut down every school in the state. Lawmakers had come up with about half that money, but the court insisted on the full amount, setting a deadline of July 8. A few days before, in meetings over the Fourth of July weekend, legislators blinked, approving the rest. This state’s Supreme Court ruled in 2012 that lawmakers are violating the constitutional rights of Washington’s 1 million schoolchildren by failing to provide them with an amply funded basic education. The McCleary decision, named after parents Stephanie and Matthew McCleary, requires the Legislature to fully fund the state’s public schools by 2018. Lawmakers so far have only come up with about $1 billion of the cost, which has been estimated at between $3.5 billion to $7 billion per two-year budget period. In September, the court found the Legislature in contempt for failing to make sufficient progress. But the court postponed punishment, giving lawmakers another chance to come up with much of that money in the next two-year budget, and a plan to provide the rest. So while wages is one component of of the strike, to me the story is Seattle is really about how teachers and other education professionals are in a dogfight with politicians demanding that they have the resources to address poverty as first responders in our society. 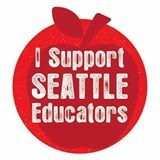 I have reblogged the SOLIDARITY STATEMENT WITH STRIKING SEATTLE EDUCATORS from Brian P Jones blog. I was asked and agreed enthusiastically to sign on. 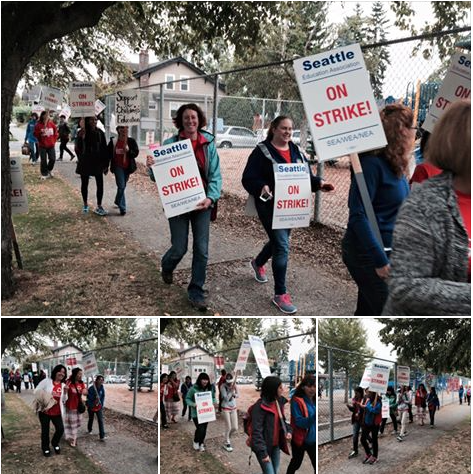 We, the undersigned stand in solidarity with 5,000 striking members of Seattle Education Association (SEA). These brave educators are taking this action in the face of growing privatization, increased standardized testing, and persistent inequality in public schooling. The educators’ demands would improve public schooling for everyone. They are demanding competitive pay, fair evaluations, less standardized testing, and end to systematic racial discrimination in student disciplinary actions. The union also represents school counselors and psychologists, and demands that their caseloads be capped, so that they can give students the individual attention they deserve. SEA is bargaining for quality education for their students, but in more than 20 meetings with the district prior to the strike vote, all of these demands were rejected. 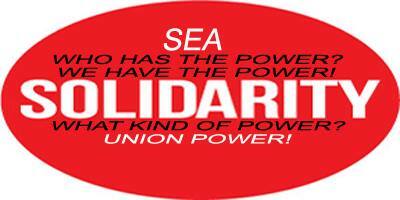 The members of SEA are fighting for the schools Seattle’s children deserve. In doing so, they are standing up for the kind of schooling all of our children deserve. 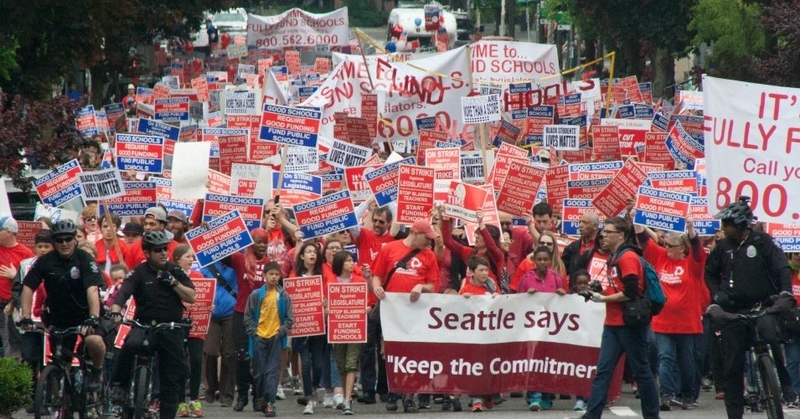 We, the undersigned, urge the Seattle Public Schools administration to grant the union’s demands immediately. To add your name, write to Brian Jones or Wayne Au. Hearing tentative agreement made in Seattle strike.